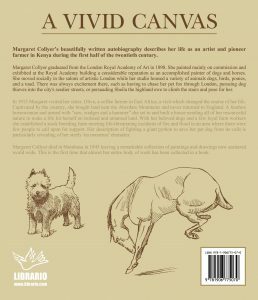 Margaret Collyer (1872-1945) is renowned as a London Royal Academy of Art-trained artist – her paintings can be found around the world and include the acclaimed The Lord of the Isles. Her artistic output, however, masks that hers was a life lived in two halves. And that lesser-known half is now drawing a lot of interest. 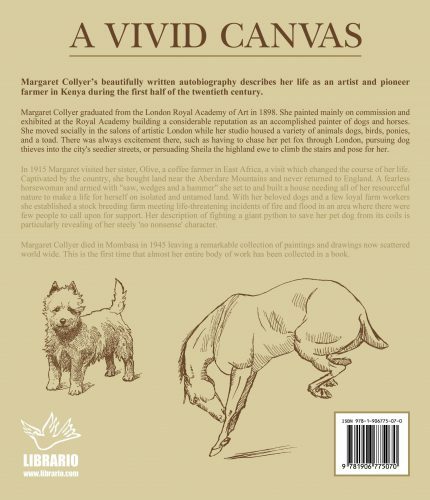 Having grown up in England, where she built a considerable reputation as a painter of dogs and horses, Margaret upped sticks in her mid-40s and became a pioneer in Kenya during the first half of the 20th century. She bought isolated and untamed land there and established a stock breeding farm. Of course, she needed somewhere to live; so, armed with ‘saw, wedges and hammer’, she set about building a home. She never returned to England. Part of the great interest in her fascinating autobiography is that it provides a woman’s perspective on making a life – and making a living – in East Africa at that time. That female perspective is rare. Indeed, there is a scarcity of historical writing about Africa full stop. So it is all the more valuable that this book is by someone who not only lived there but who was properly integrated into the way of life. art – especially (but not exclusively) drawings and paintings of animals.